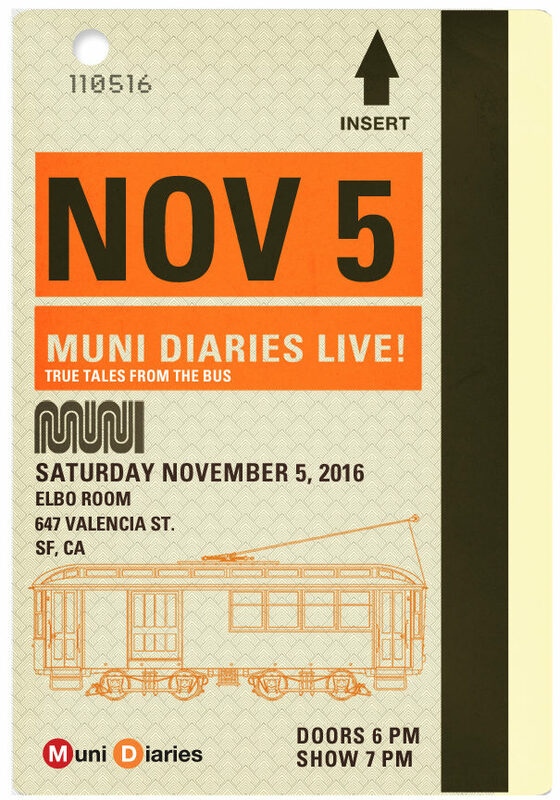 Muni Diaries Live this Sat! Door tickets still available! Our favorite night of the year is returning tomorrow at the Elbo Room, where we’ll get to see your shiny faces at Muni Diaries Live! We are sold out of online tickets, but have saved some tickets at the door, which opens at 6 p.m.
Joe Fitzgerald Rodriguez is a San Francisco native reporting the hell out of his beloved foggy city by the bay. He is the staff reporter covering public transportation and politics at the San Francisco Examiner, where he has a delightfully good time outing the dirty laundry of politicians in power and giving voice to the voiceless. Corny? Sure thing. A calling? That, too. You can find his writing at the SF Weekly, El Tecolote, Ingleside Light, and Fog City Journal. Justina Wu is a San Francisco-based writer, storyteller, and producer of Beyond Borders Storytelling, a series of bi-monthly workshops and story jams for wanderlusting adventurers. If you can’t find her on social media, she might be riding her bike, hanging from a rock, or eating a pork chop. Please don’t text while operating a motor vehicle, and for God’s sake stop driving in the bike lane. Sarah Hunt is a cartoonist and writer helping leaders tell personal vision stories. When she’s not erasing the streaks on her cartoons during a jerky Muni turn or philosophizing with lost tourists on a Millbrae express, she’s busy translating her jokes from Australian to American. A native of Louisiana, WooWoo Monroe is now living in San Jose and making her mark on the Bay Area drag scene. WooWoo has been performing drag for almost four years and hosts her own successful “CIRQ-US” Show in San Jose at Renegades Bar. She is also the co-host of a monthly Sunday brunch in San Jose benefiting the Silicon Valley Pride Organization. Her expansive and eclectic style of drag can go from high camp to glamorous. Not taking herself seriously is part of her game and her drag pokes fun at everyone, including herself. She has often said that from the neck down she is all woman and from the neck up it’s Ringling Brother’s. WooWoo is a former Miss California Gold title holder, which she worked very hard to win in 2015. Beloved by everyone who knows her, WooWoo has become a rising star in the Bay Area drag scene and is looking forward to many more successful years to come.